The attractive and significant seat outside the front of the Mapleton Community Library was designed, constructed and donated by the Mapleton Men’s Shed. The seat was built in 2015 to celebrate the centenary of the Mapleton Tramway, which operated from 1915 until 1944. The wheel assemblies are from one of the wagons drawn by the Shay geared locomotive which operated on the steep tramline between Nambour and Mapleton, and carried the district’s produce, timber, mail and people. Our library began operation in 1985 as an arm of the Maroochy Shire. A handful of volunteers from our community and willing staff from the Nambour Library set up ‘shop’ in premises which stood near the corner of Obi Obi Road and Post Office Road. A fire destroyed the old timber building in August 1992 and the Shire library felt they could not replace the books. We were in danger of losing the community library. 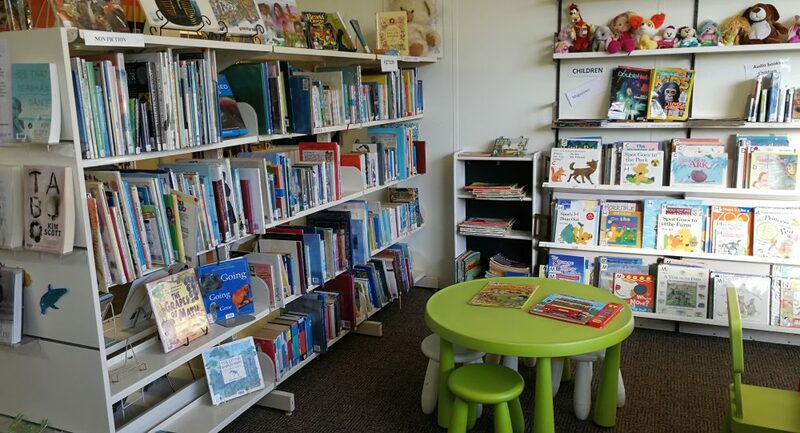 However, the Mapleton community, now accustomed to the convenience of having their own library, were quick to raise funds and with council support, a new library opened just seven months after the fire. Council and the Mapleton RSL sub-branch arranged for a building to be placed at the Obi Obi road entrance to RSL Memorial Park – where the library is still located. The library has developed into a well-loved part of our community. The volunteers have managed to create a modern, professional library service with a fine collection comprising approximately 10,000 titles. The number of volunteers has been constant at about 40 over the years. Our committee is elected at the AGM each year, with many office bearers holding their positions for several years. Fund raising and grant applications are important parts of the work. Recommended Reading: Mapleton Community Library – The First 10 Years – Patsey Ruth Richards. In September 2016, an evening celebration on Mapleton Memories was held to commemorate our community history. Copies of the speaker’s talks can be viewed on the Mapleton Memories page.